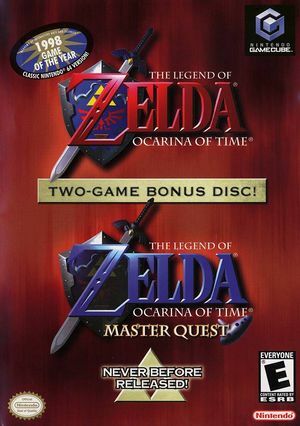 Originally released as a bonus disc for those who pre-ordered The Legend of Zelda: Wind Waker, The Legend of Zelda: Ocarina of Time / Master Quest contains GCN versions of Ocarina of Time and the never-released 64DD title Ura Zelda, a remixed version of Ocarina of Time with harder dungeons. These emulated versions of the N64 games have several technical improvements over the original N64 versions, such as 640x480 resolution and 480p Progressive Scan support. Setting XFB to Real fixes random flickering in some places and displays the loading bar on the "Reading Game Disc" screen. Fixed with Hybrid XFB in 5.0-5874. The graph below charts the compatibility with The Legend of Zelda: Ocarina of Time Master Quest since Dolphin's 2.0 release, listing revisions only where a compatibility change occurred. r6787 Windows 7 Intel Core i7-950 @ 3.06GHz NVIDIA GeForce GTX 460 DX9: Some minor texture glitches+overall grainy appearance. DX11: No graininess, but texture errors since DX11 lacks EFB Copy to RAM and Real XFB. This page was last edited on 23 May 2018, at 20:20.